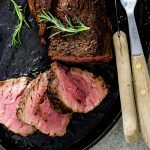 Rosemary-crusted beef fillet with horseradish cream is perfect for effortless entertaining and will make a fantastic main dish recipe at any dinner party. Heat a large cast iron skillet over high heat. Place the whole fillet of beef on a large chopping board. Drizzle over the olive oil and rub all over the fillet. Sprinkle the chopped rosemary, salt and pepper on to the chopping board then roll the beef fillet into the seasoning, making sure you cover the entire surface of the fillet. Sear the beef fillet on all sides until golden brown then place in the oven and allow to roast for 20 minutes until a meat thermometer inserted reads 55ºC/130ºF for rare-medium rare meat. Remove from the oven then cover with foil and allow to rest for 10 minutes. In that time, mix together all the ingredients for the horseradish cream and season to taste with lemon, salt and pepper. Slice the beef fillet and serve with the horseradish cream.